Splicing wires by using wire nuts and electrical tape is both time consuming and unreliable. The wires need to be cut, stripped, properly twisted and then the wire nut is screwed onto the twisted splice. Most often electrical tape is added to the nut to assure that the nut does not fall off leaving exposed wires. This is a labor intensive, time consuming process. The quality of the connection and time spent making the splice is entirely based on the skill level of the installer. There is no way to visual inspect the splice when using wire nuts and electrical tape..
T-series – for branching a wire. Two Way series – for adding fixtures or components. Use Two Way Series connectors have a unique dual channel which allows pre-assembly onto a component or fixture. Once installed, the wiring can be completed by simply attaching the wire to the existing wiring. One Way series – for splicing lines. For Mechanical Dampening, Noise Supression, Electrical Insulation. provide the correct spacing while allowing the screw to be fully tightened down. 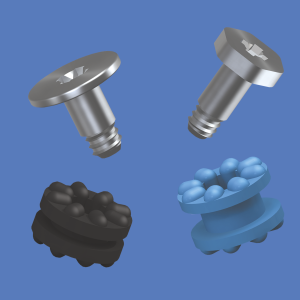 as unassembled sets (Insulator and Screw).